John Naughton is The Observer's "Networker" columnist, a prominent blogger, and vice president of Wolfson College, Cambridge. The Times has said of his writing, " it] draws on more than two decades of study to explain how the internet works and the challenges and opportunities it will offer to future generations," and Cory Doctorow raved that "this is the kind of primer you want to slide under your boss's door." 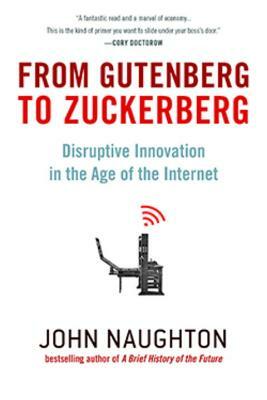 In From Gutenberg to Zuckerberg, Naughton explores the living history of one of the most radically transformational technologies of all time. From Gutenberg to Zuckerberg is a clear-eyed history of one of the most central features of modern life: the internet. Once a technological novelty and now the very plumbing of the Information Age, the internet is something we have learned to take largely for granted. So, how exactly has our society become so dependent upon a utility it barely understands? And what does it say about us that this is the case? While explaining in highly engaging language the way the internet works and how it got that way, technologist John Naughton has distilled the noisy chatter surrounding the technology's relentless evolution into nine essential areas of understanding. In doing so, he affords readers deeper insight into the information economy and supplies the requisite knowledge to make better use of the technologies and networks around us, highlighting some of their fascinating and far-reaching implications along the way.